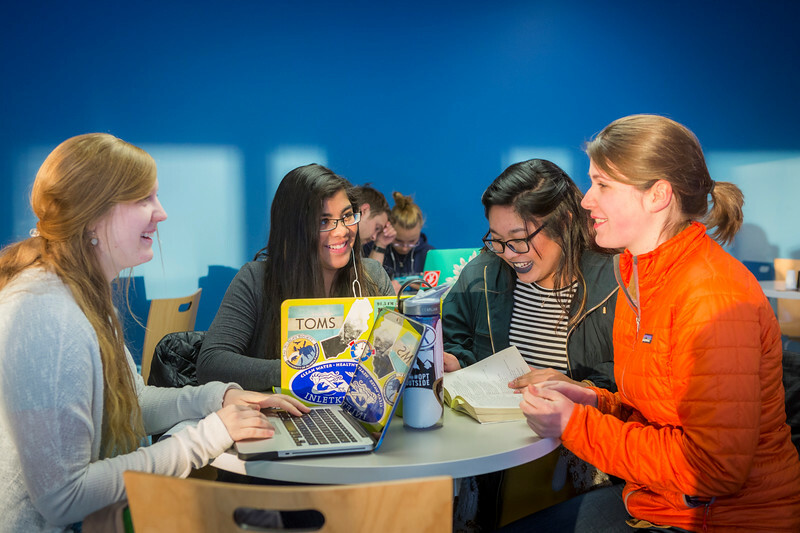 Sara Williams, Maria Isabel Castro, Cellest Bulfa and Grace Bolt study at Arctic Java on Thursday, Feb. 2, in Wood Center on the Fairbanks campus. 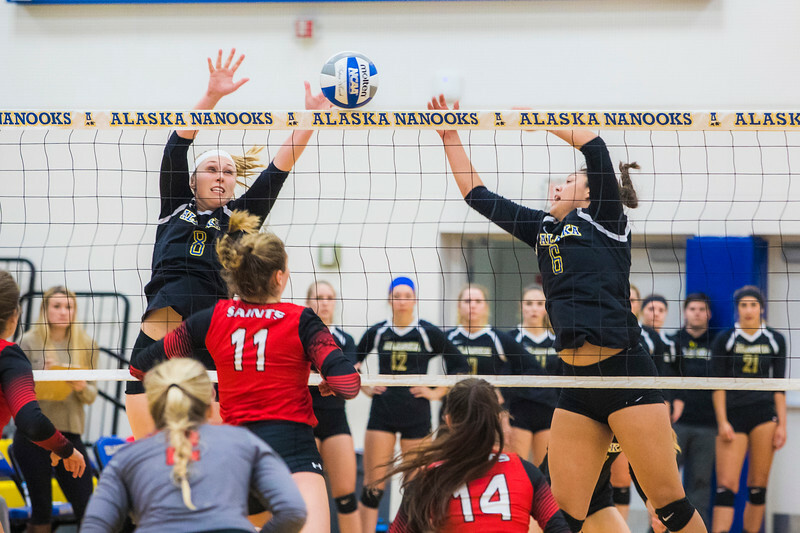 A group of UAF students join the 40° below club by posing in their shorts or swimsuits by the time and temperature sign at the Fairbanks campus. 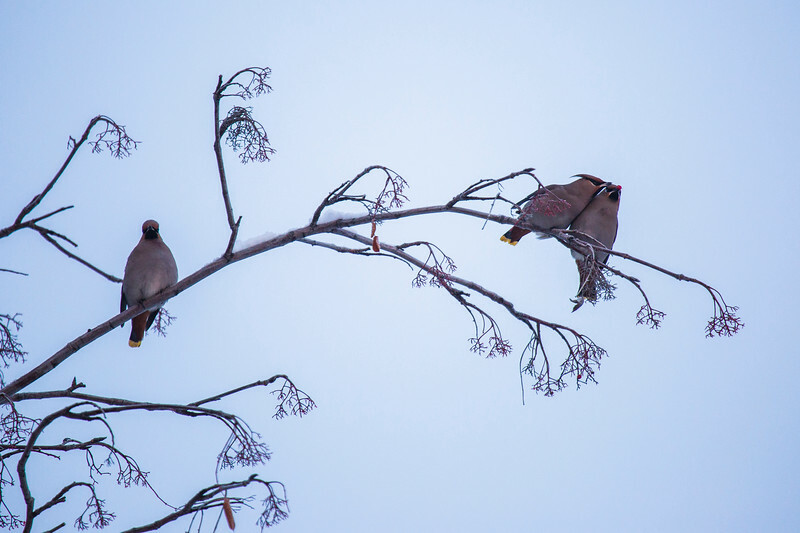 Bohemian waxwings eat berries in front of the Chapman Building on the Fairbanks Campus. 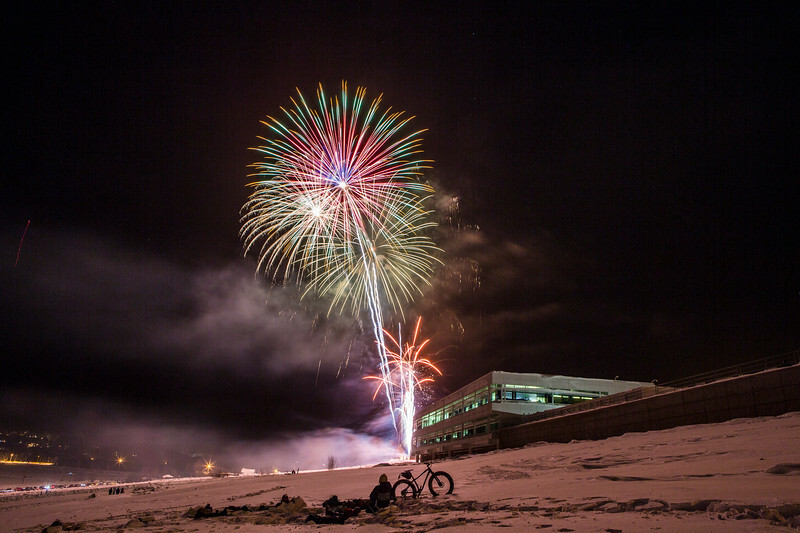 UAF kicks off the 100th anniversary celebration during the 27th Sparktacular event at the Fairbanks campus. 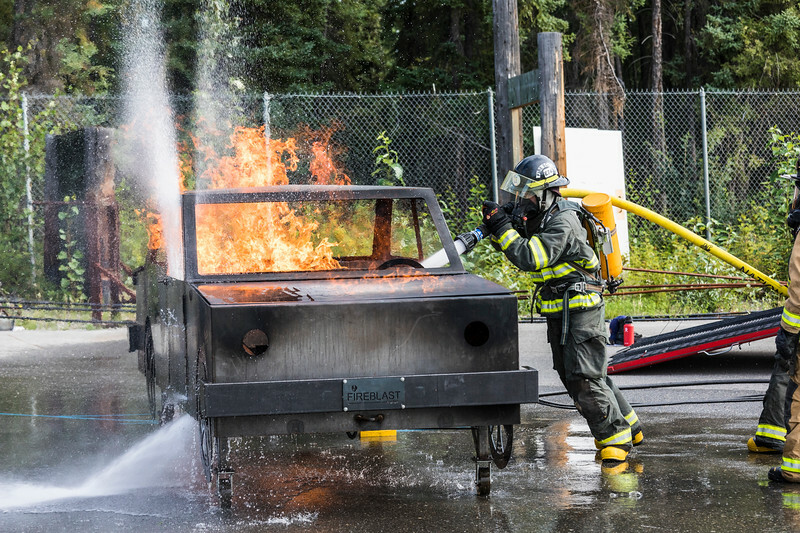 A participant in UAF Community and Technical College's 2017 Summer Fire Academy practices on a simulated car fire at the Fairbanks Regional Fire Training Center on Monday, July 31, 2017. 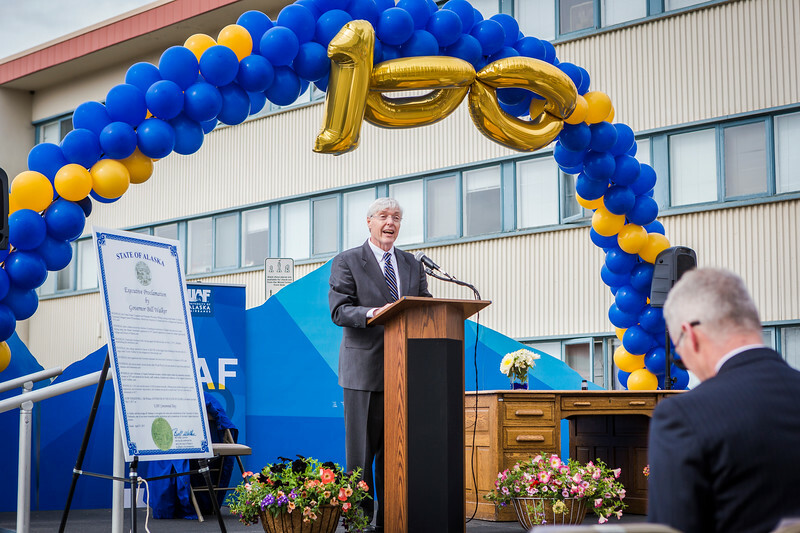 Chancellor Dana Thomas commemorates UAF's 100th anniversary May 3 in Centennial Square. On the same date in 1917, Territorial Gov. 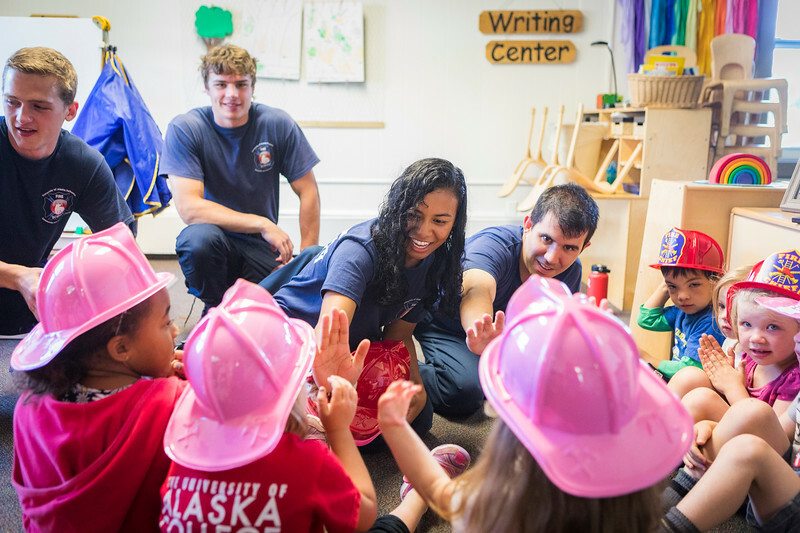 John Strong signed the bill to create the Alaska Agricultural College and School of Mines, precursor to the University of Alaska and UAF. 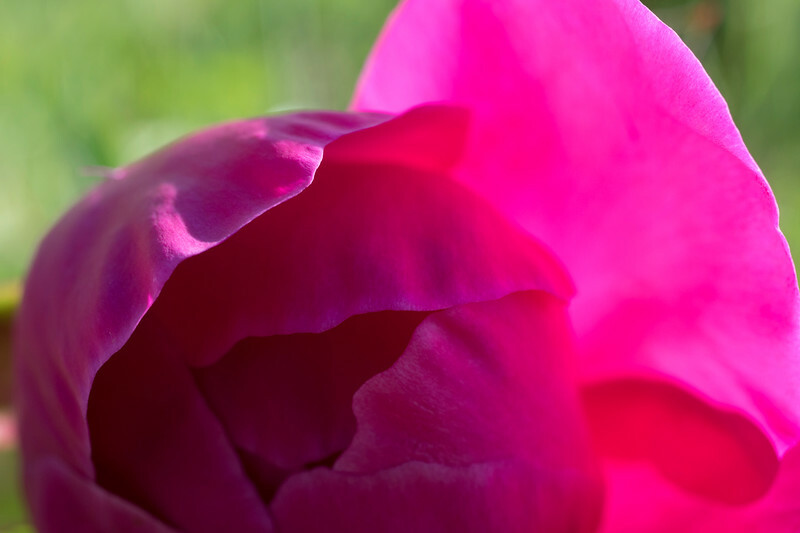 A variety of peonies are in bloom at the Georgeson Botanical Garden at the Fairbanks campus. 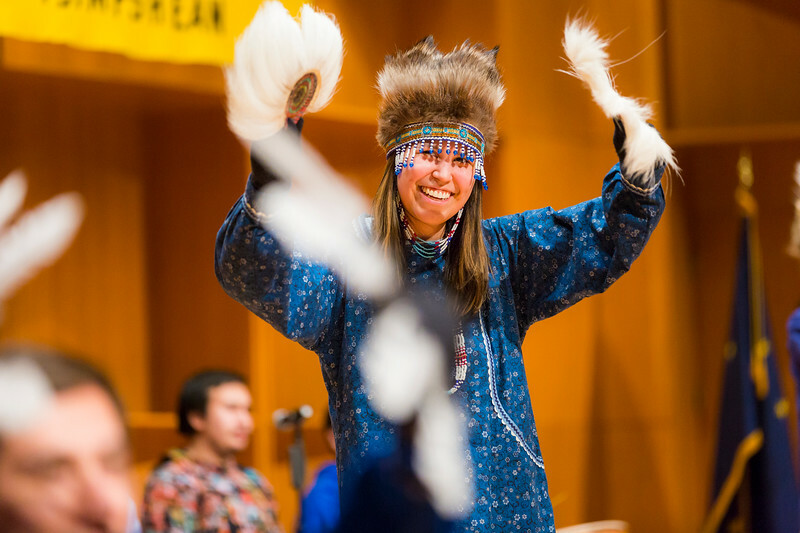 Wildlife and conservation biology student Roberta Walker, from Unalakleet, dances with other members the Iñu-Yupiaq Dance Group during the 2017 Festival of Native Arts at the Davis Concert Hall. 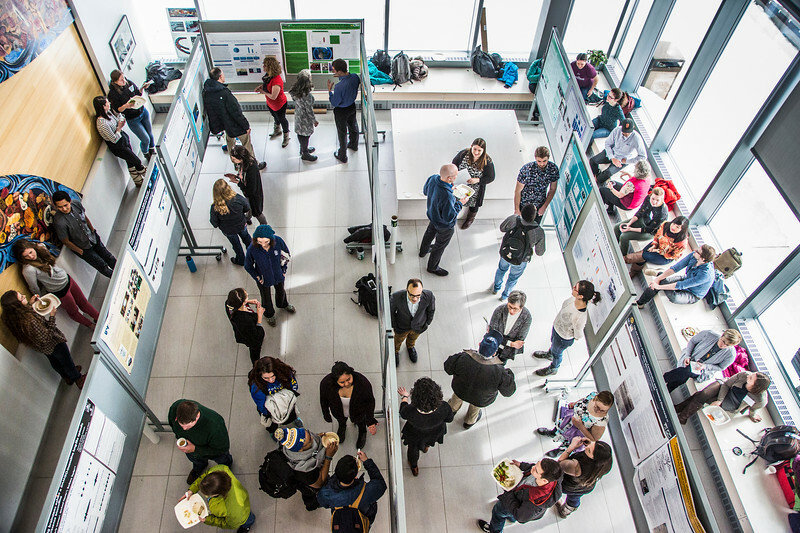 UAF Biomedical Learning and Student Training researchers present their scientific posters on Tuesday, March 28, in the Murie Building lobby at the Fairbanks campus. 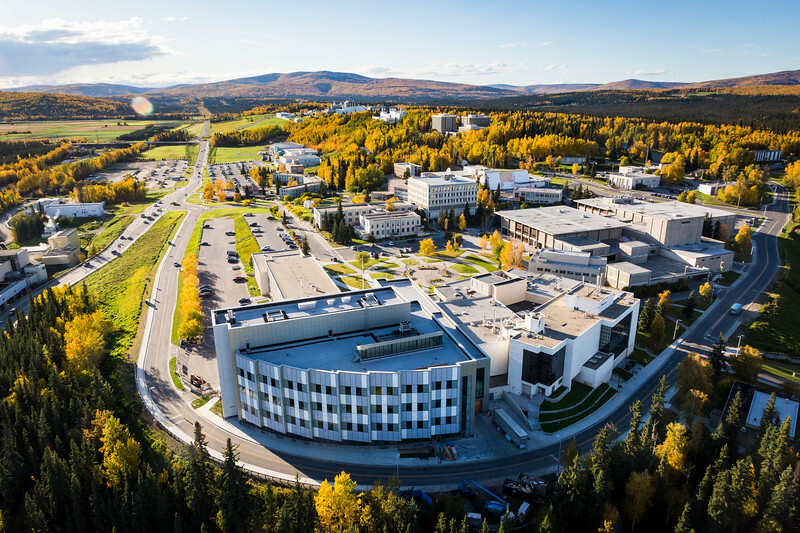 The Regents' Great Hall, on the Fairbanks campus, is now open to the public. 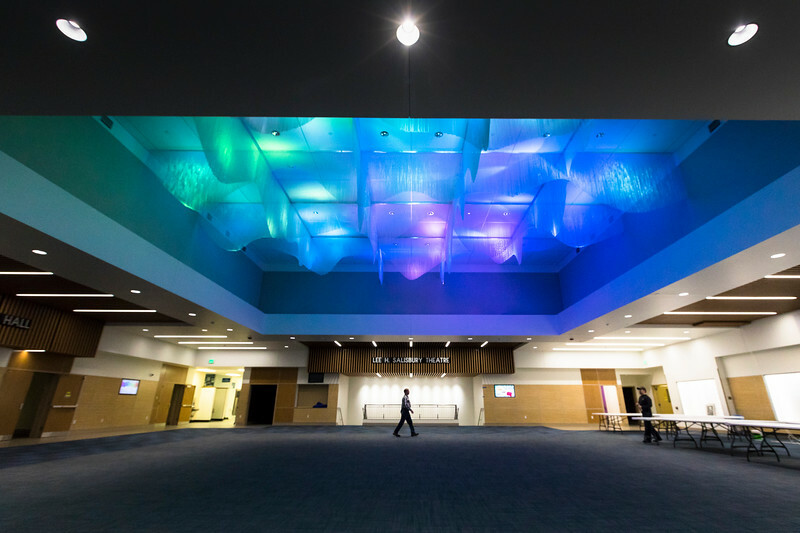 The newly refurbished hall features an aurora-like installation on the ceiling. 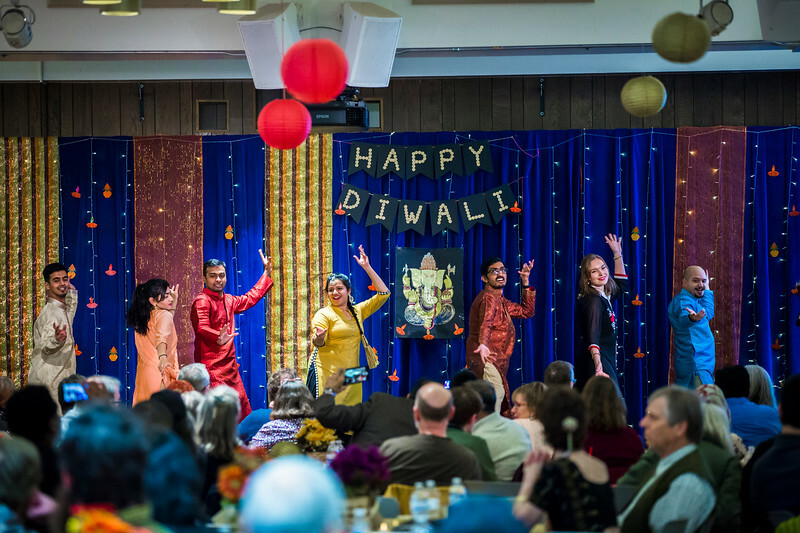 Administration, Alumni, students, staff, faculty, and members of the community, celebrate Diwali with lights, food, dancing, and good company at an event organized by the UAF Namaste India student organization at the Wood Center Ballroom. 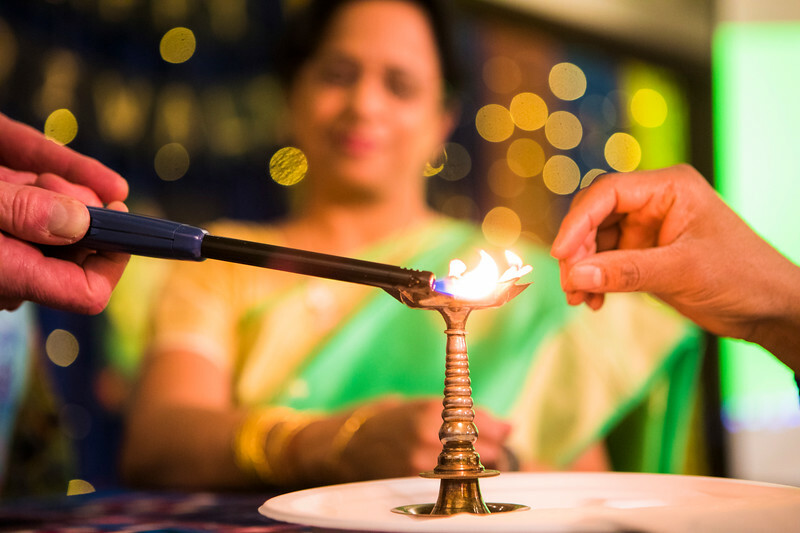 Tori Administration, Alumni, students, staff, faculty, and members of the community, celebrate Diwali with lights, food, dancing, and good company at an event organized by the UAF Namaste India student organization at the Wood Center Ballroom. 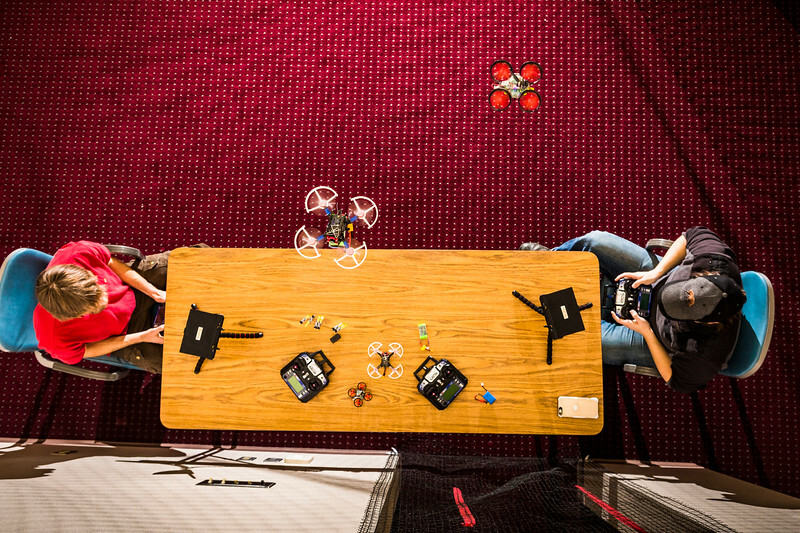 Alaska Center for Unmanned Aircraft Systems Integration pilots Matthew Westhoff and Robert Parcell test small UAVs at the Keith B. Mather Library where students will be able to check them. 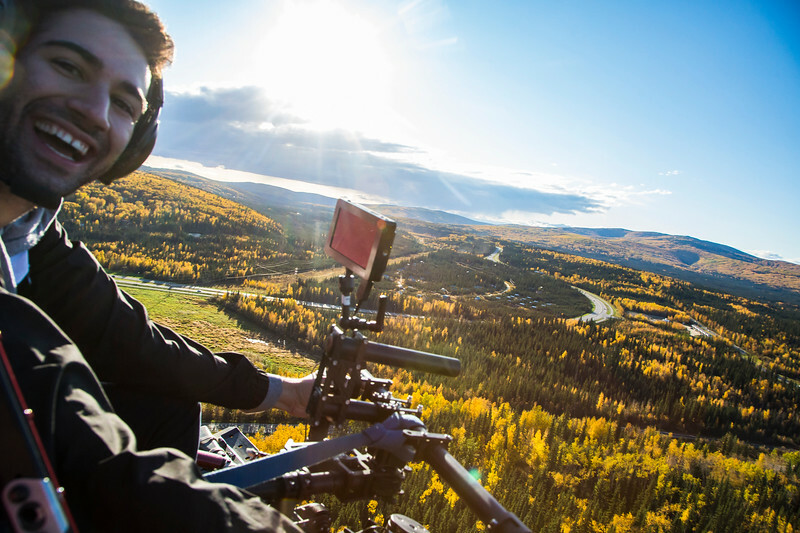 Research Associate Professor Anna Liljedahl and graduate research student Allen Bondurant gather field data Goldstream Creek discharge in Fairbanks. 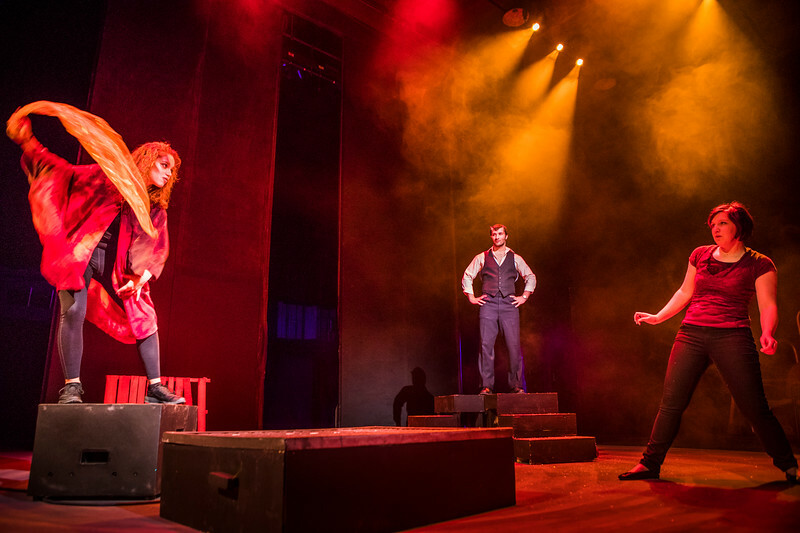 UAF Theatre students from left, Ariana Polonco, Darren Napoli and Victoria Nelson perform "Ace" by student Frederica Matumeak inside the hall underneath the Salisbury Theatre. 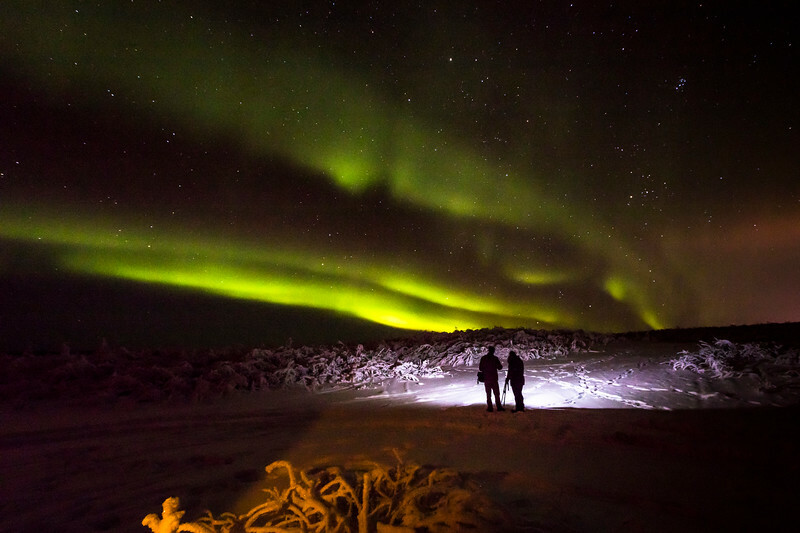 UAF students photograph the aurora during a workshop held by UAF Outdoor Adventures at Murphy Dome. 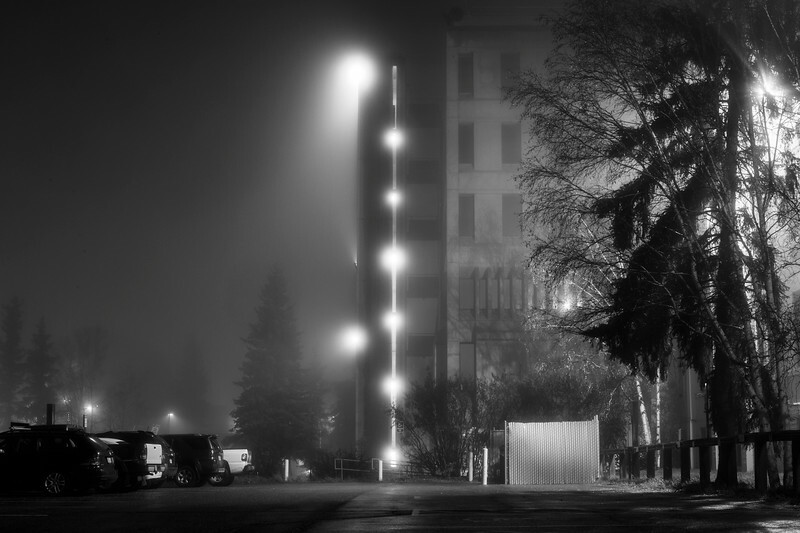 A thick fog blanketed campus and the Fairbanks area Friday, October 13, 2017. 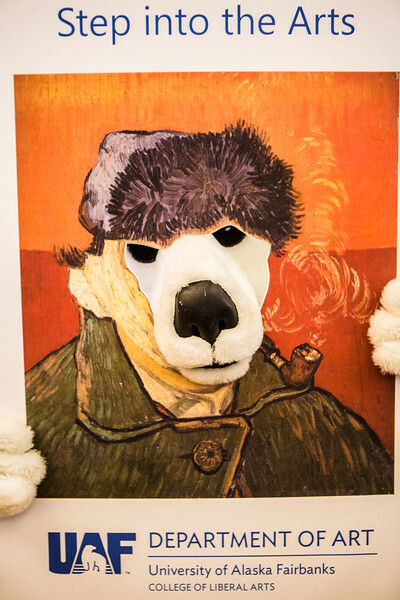 The Nook steps into a picture frame of Vincent Van Gogh during the annual We Are CLA event at the Wood Center Ballroom. 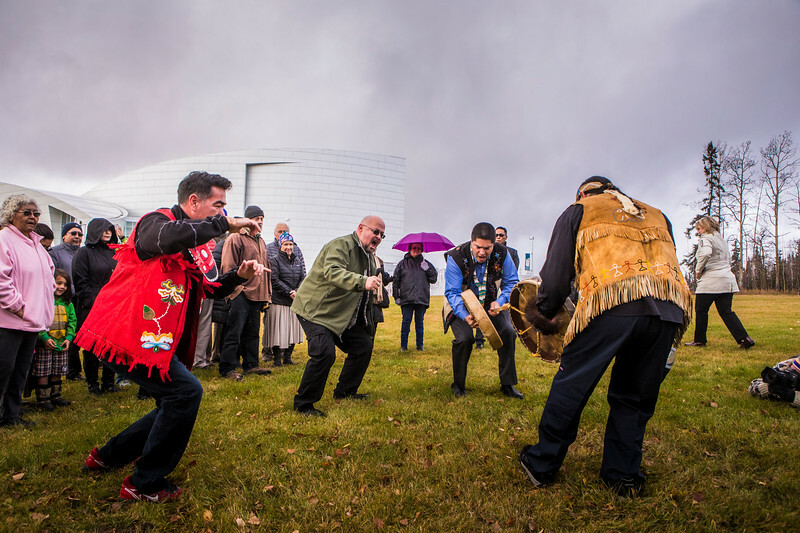 UAF students, staff, faculty, and community members gather at Troth Yeddha’ Park to commemorate the 2017 Indigenous Peoples Day at the Fairbanks campus. 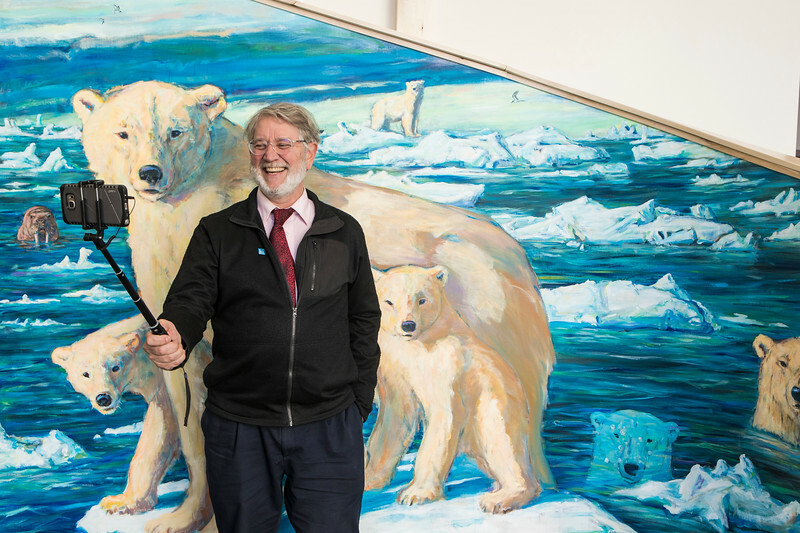 UAF College of Liberal Arts Dean Todd Sherman takes his own picture in front of the "selfie station" in the University of Alaska Museum of the North before signing the artwork on Tuesday, Sept. 26, 2017. Sherman painted the piece while members of the public looked on as part of the museum's "Polar Passion" special exhibit. 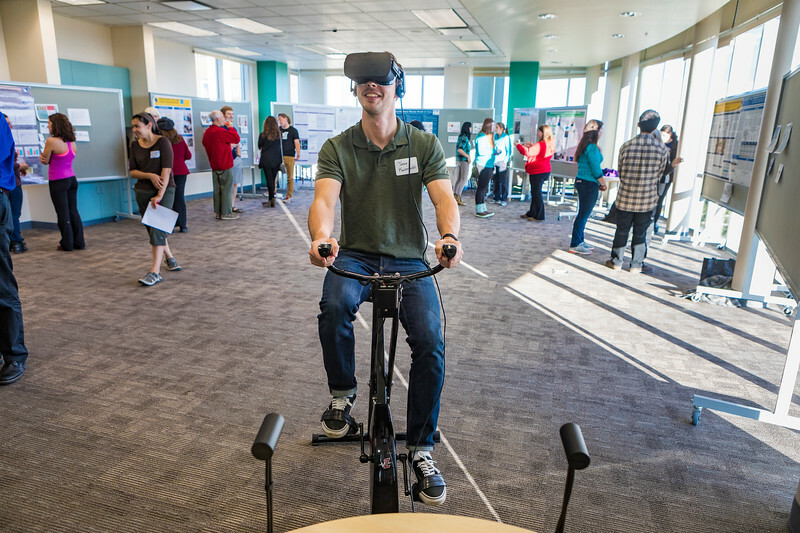 School of Management student Jesse Kaczmarski demonstrates his research using virtual reality during an event hosted by the Biomedical Learning and Student Training program at the IARC building on campus. 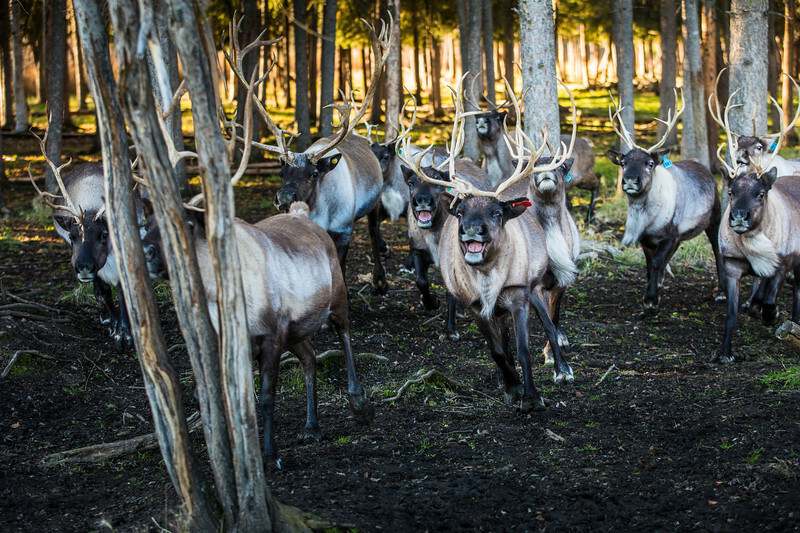 Rindeer run around an enclosement at the Fairbanks Experiment Farm during the "Know Your Reindeer" centennial event on campus Sunday, Oct. 1. 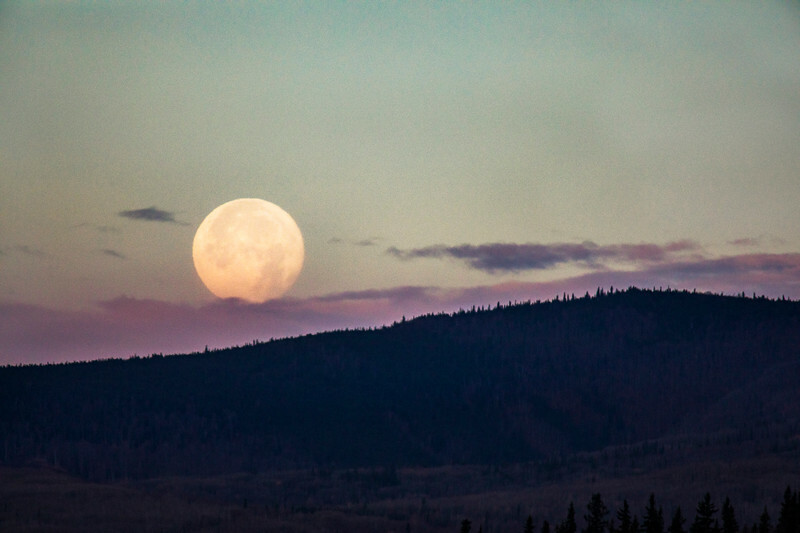 The Harvest Moon, as seen from campus, sets behind Ester Dome on the morning of Friday, October 6, 2017. 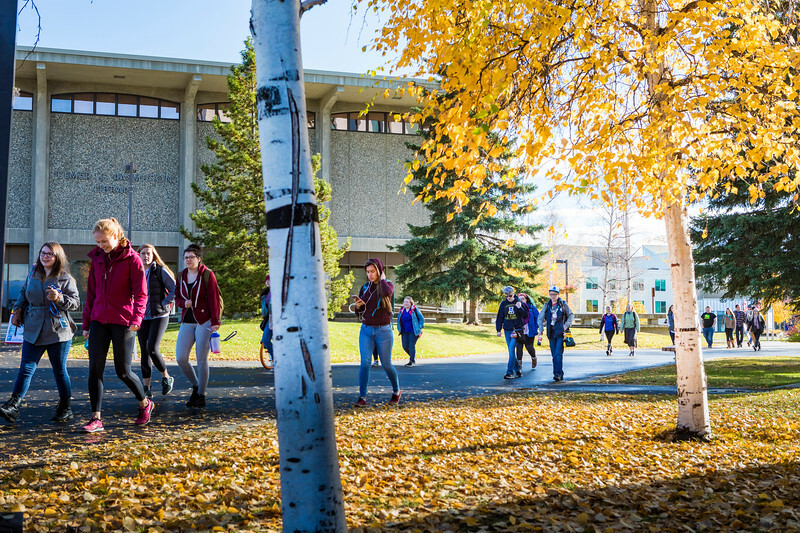 Students walk to and from class on a late September afternoon. 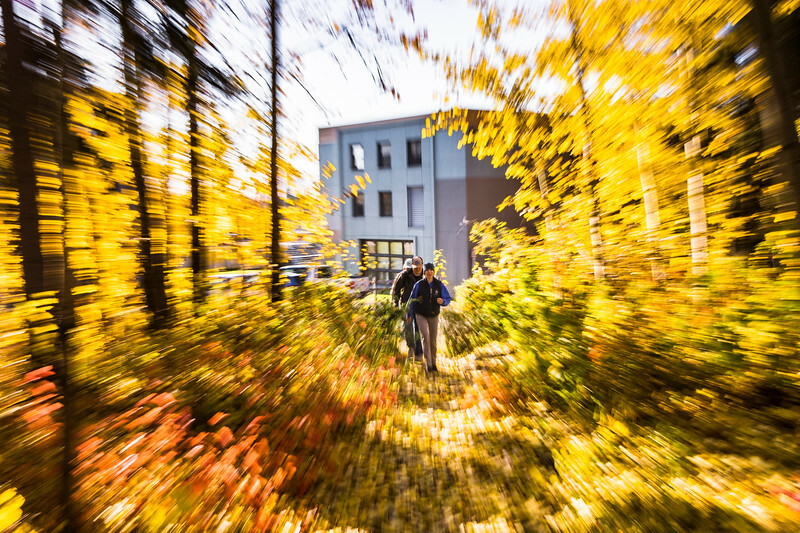 Members of the UAF rifle team walk toward the Wood Center during an autumn afternoon at the Fairbanks Campus. 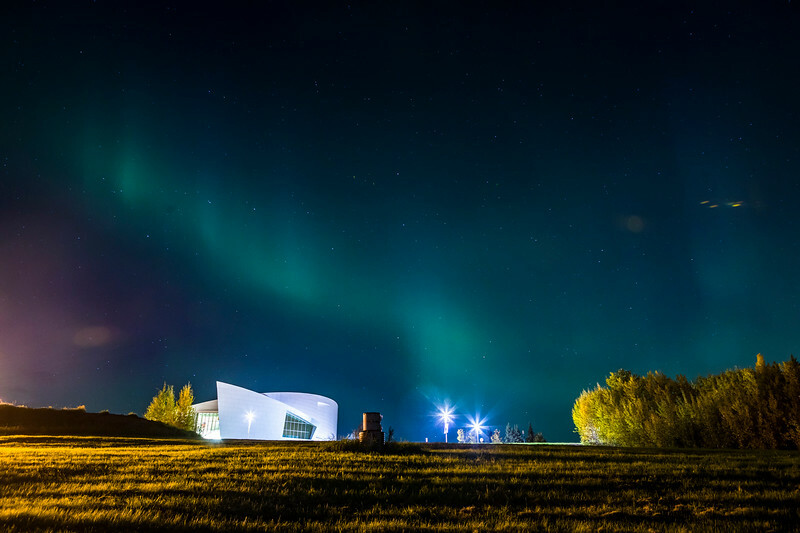 The aurora dances above the UA Museum of the North on a mid-September morning. 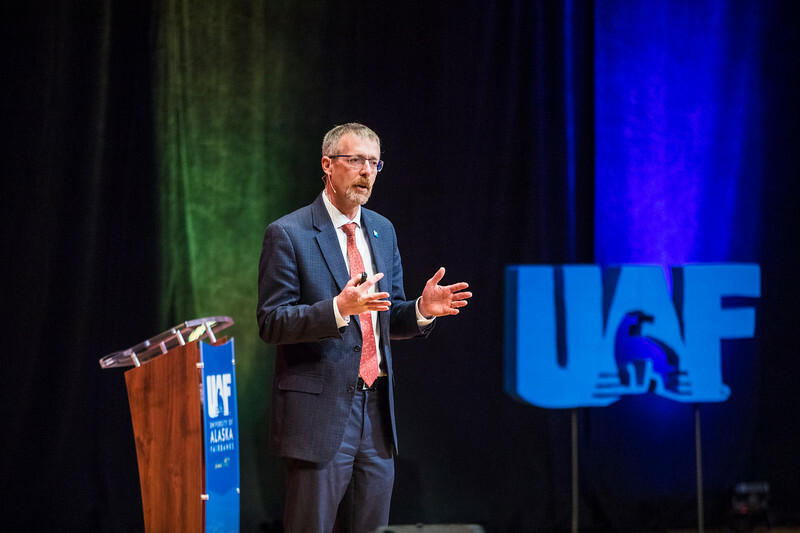 Chancellor Daniel M. White speaks to students, staff and faculty in the Davis Concert Hall during convocation event Sept. 12, 2017. 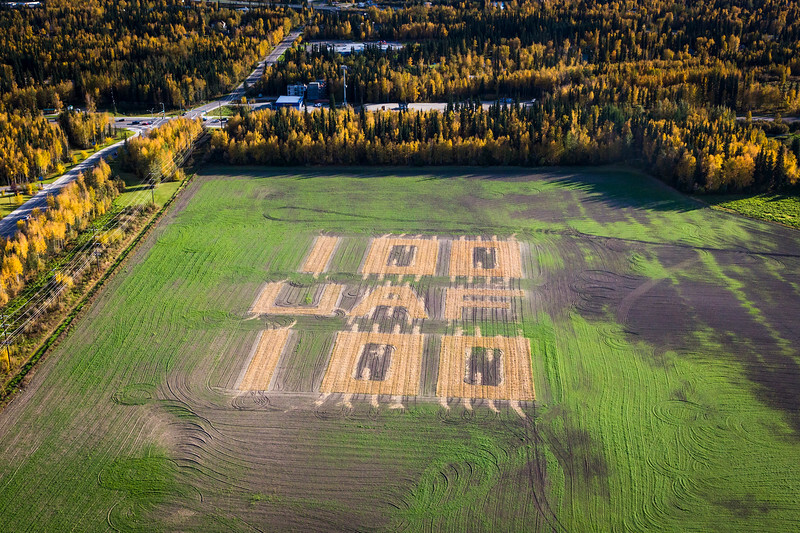 In honor of UAF's 100th anniversary, the Fairbanks Experiment Farm created a barley display at te field. 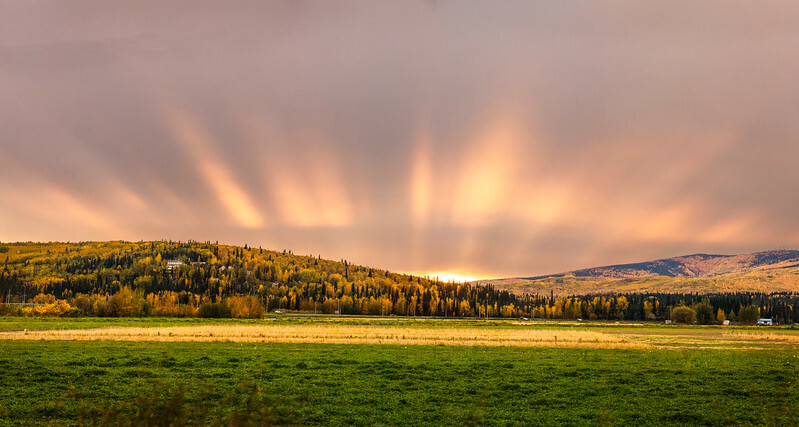 The setting sun glows over the fields of the Agriculture and Forestry Experiment Station Wednesday, Sept. 13. 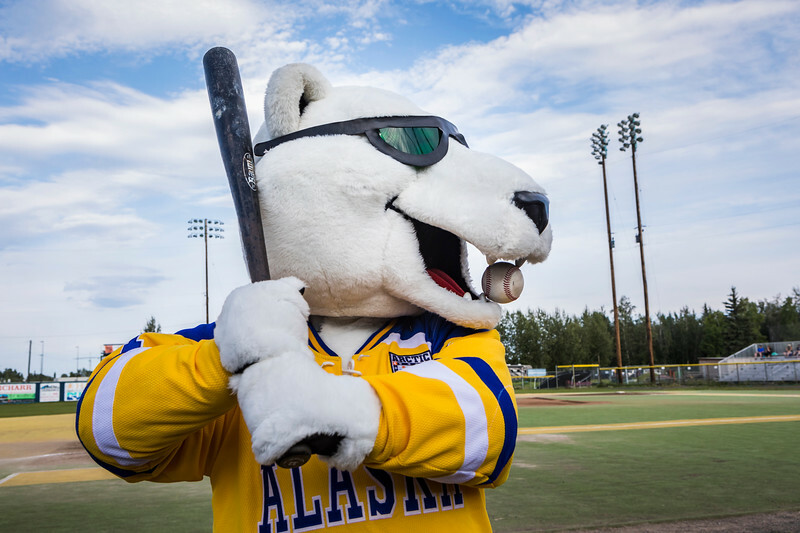 Members of Nanook Nation wear their blues and golds during the 2017 Golden Days Grande Parade in downtown Fairbanks on July 22. 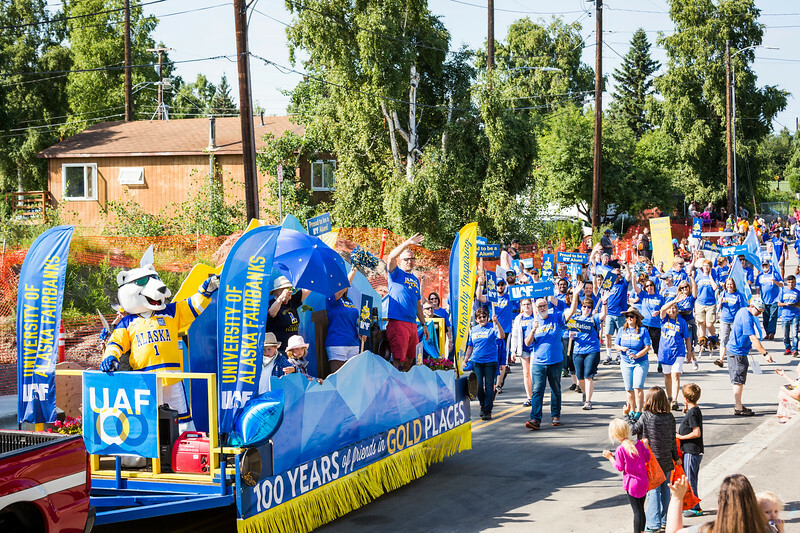 Judges awarded UAF's float, which celebrated the university's centennial, as the best noncommercial entry. 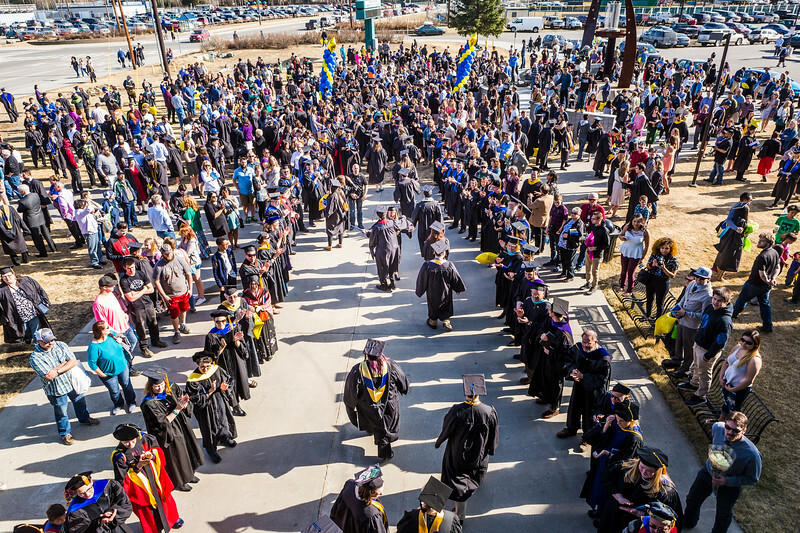 Forming two lines outside the Carlson Center, faculty greet and congratulate graduates after the Commencement 2017 ceremony on May 6 in Fairbanks. 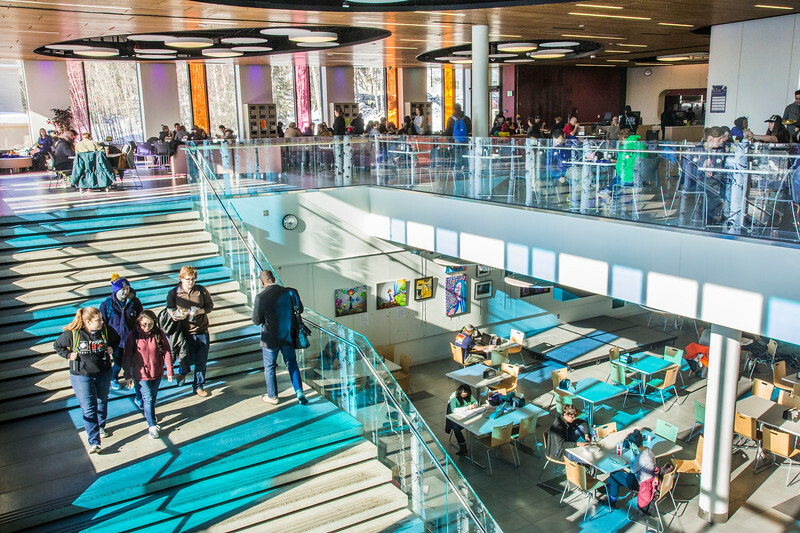 Sunlight floods the Wood Center dining facility on a late March afternoon. 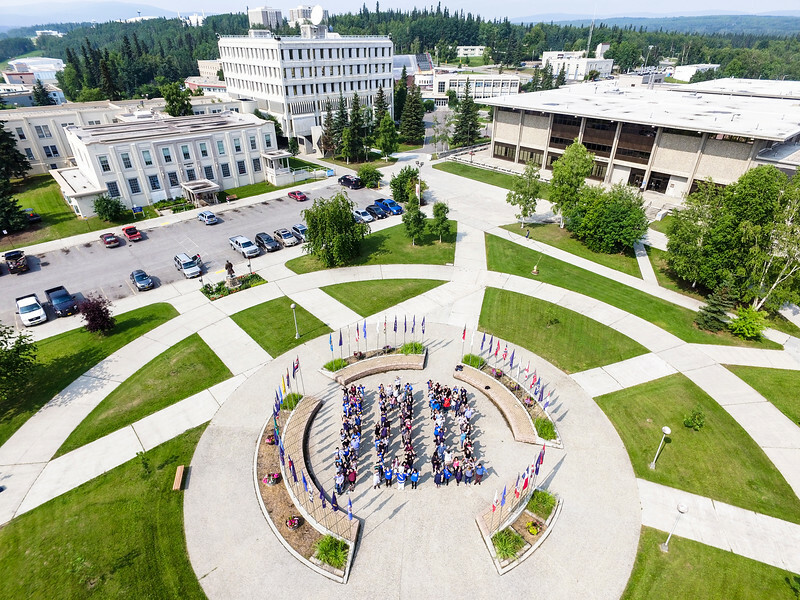 Members of Nanook Nation gather for a group photo celebrating UAF's centenial anniversary at the Fairbanks campus' Cornerstone Plaza July 12, 2017. 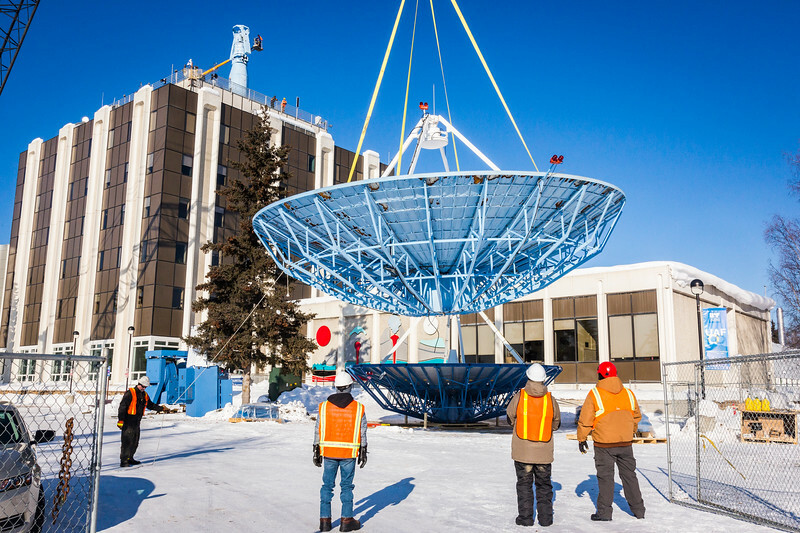 A crane lowers the old 10-meter antenna from the roof of the Elvey Building on Thursday, March 16, 2017, ending the dish's 25 years of service to the Geophysical Institute on the Fairbanks campus. A new 9-meter antenna will replace the retired dish and continue to retrieve scientific data from polar-orbiting satellites. 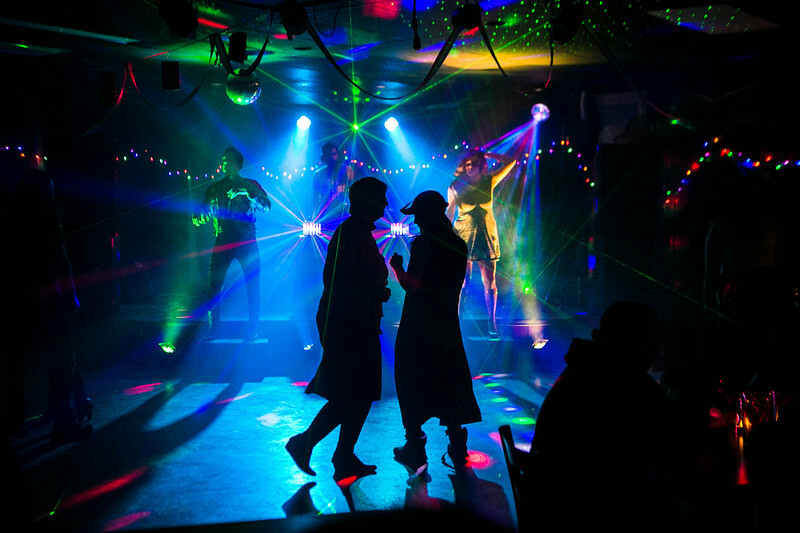 Students dance to the music during the UAF Pub's Pride Night event at the Fairbanks campus. 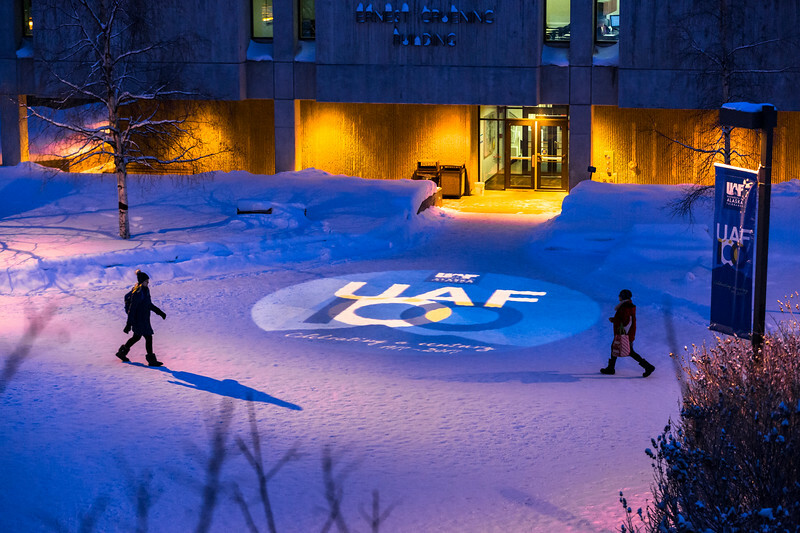 A projection of UAF's 100 year anniversary logo is seen next to the Gruening Building Friday, January 20, 2017. 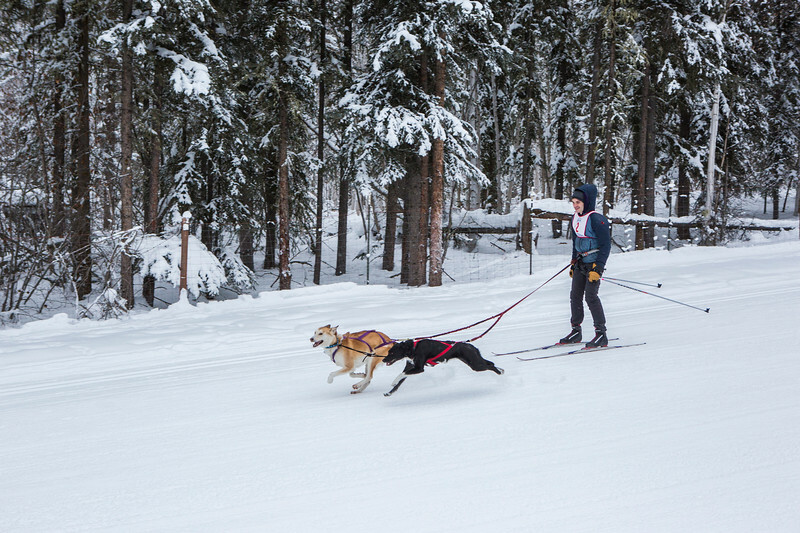 Earth science student Brian Reggiani skijours with his dogs Funky and Olive during a race sponsored by Alaska Skijoring and Pulk Association at the Fairbanks campus. 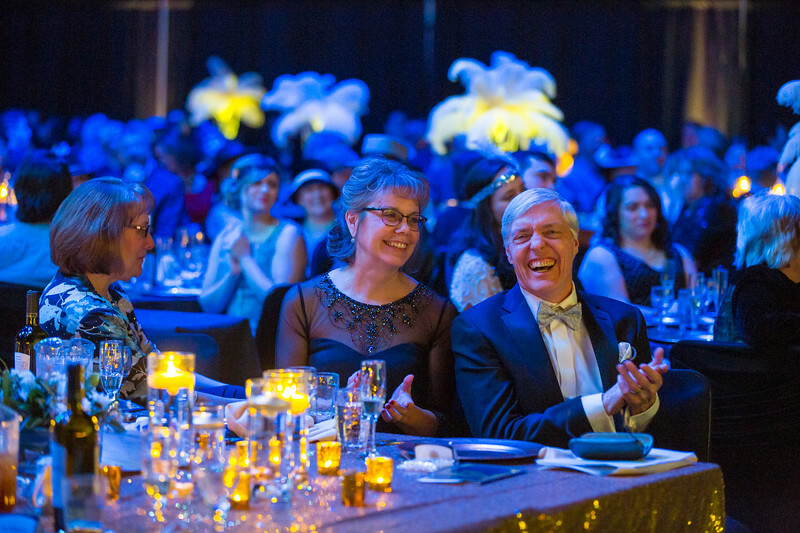 UAF Interim Chancellor Dana Thomas and wife Kay join students, staff, faculty, and members of the community during the 2017 Blue and Gold Gala event at the Carlson Center. 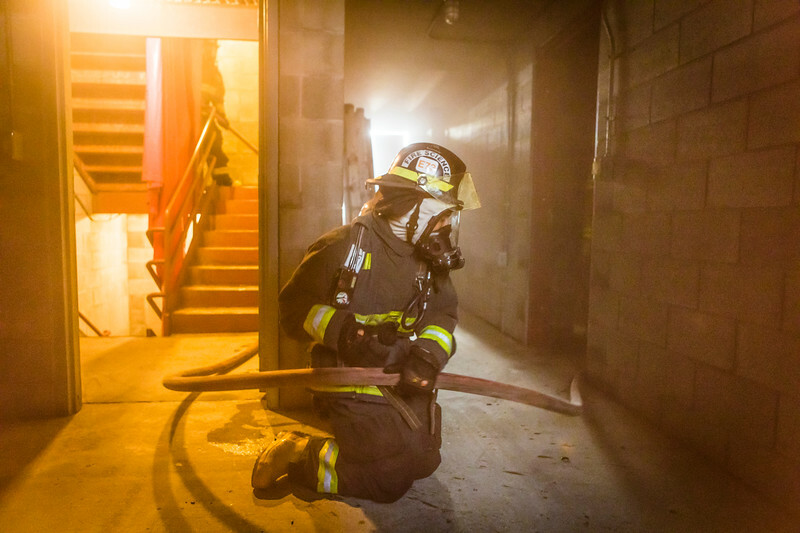 The event raised over $100,000 for student scholarships. 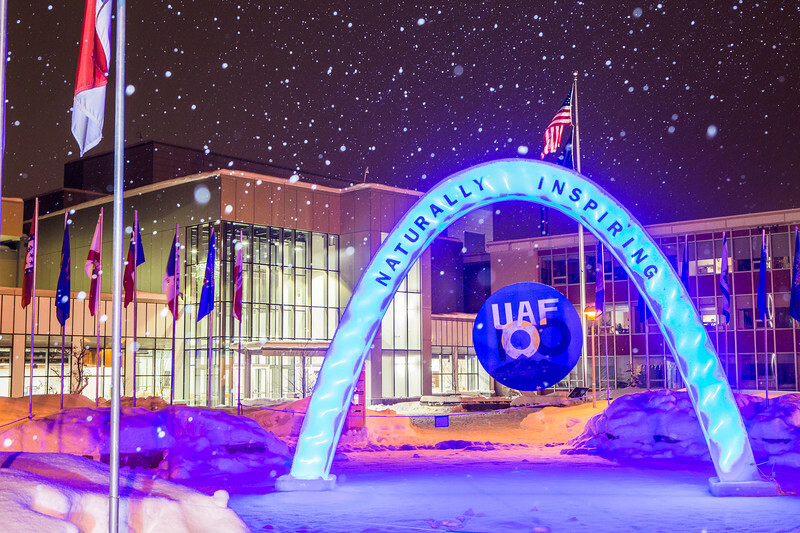 The 2017 ice arch stands temporarily at the Cornerstone Plaza on the Fairbanks campus. The arch was constructed by a team from the Associated General Contractors / American Society of Civil Engineers student chapter and was sponsored by AGC/ASCE, Spenards Business Supply and the GHEMM Company. 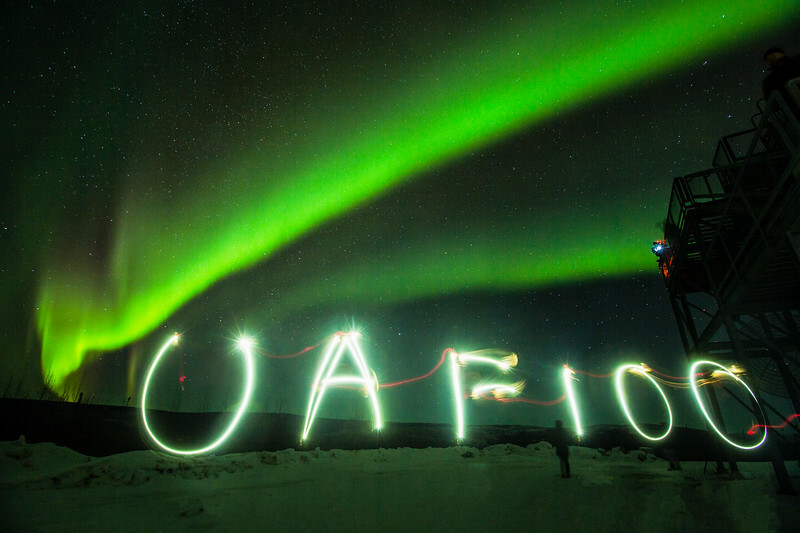 While waiting for rocket launches at the Poker Flat Research Range on Feb. 16, spectators paint "UAF 100" with light during a stunning aurora display. 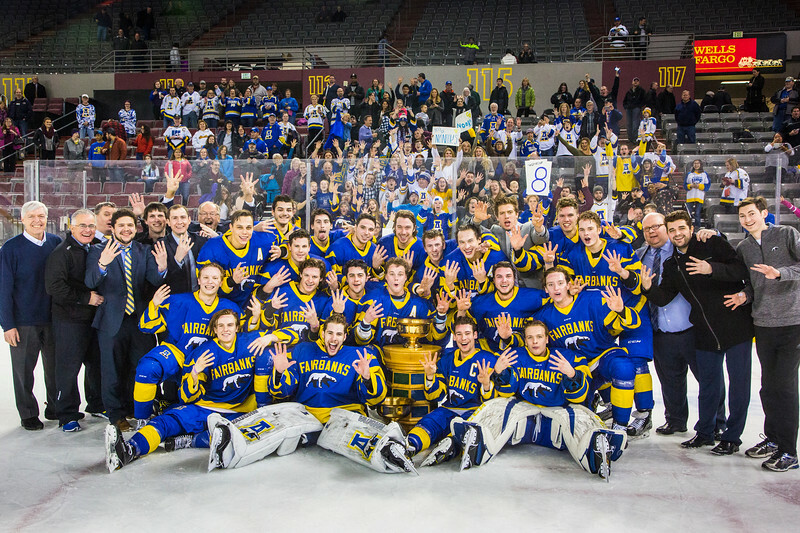 This year is UAF's centennial. 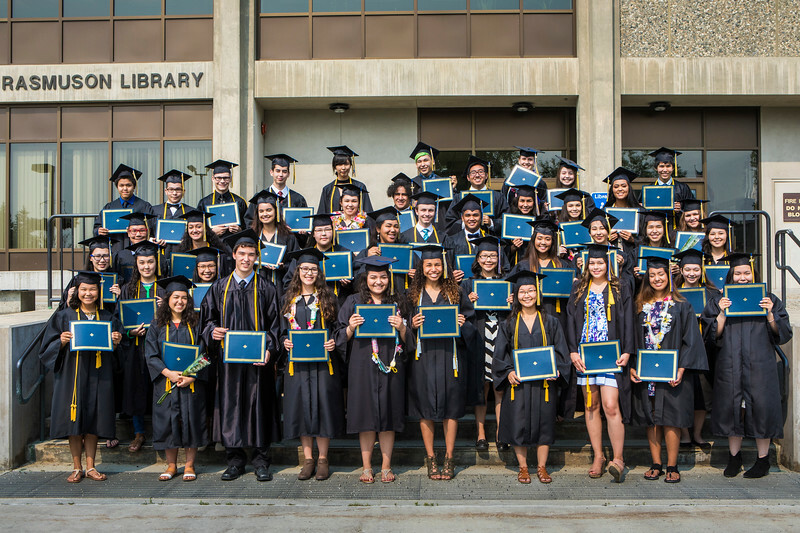 Participants in UAF's 2017 Rural Alaska Honors Institute gather in front of the Rasmuson Library after their graduation ceremony Thursday, July 24, 2017.